15th c, Sophora (Huai), Shanxi. Age, extinct wood, rare “Heavenly Stallion” motif, beautiful deep carving; all-original. The basic frame work of this table is attributed to Sophora, the drawers and carved panels to Cypress, and the side panels to miscellaneous wood. Sophora is characterized by its relatively deep straight grains and somewhat uneven texture; it never warps. (Read more about this wood on our site). The top of this table is made of a single plank and has everted ends on which can be seen hand hammered boss-head nails which are also found on the frame of the drawer fronts. These decorative nails are often featured on furniture made in the Yuan and Ming periods. Metal was expensive then, so decorating with nails could be a status symbol. The two drawer front panels have deep carvings of the mythical Heavenly Stallions galloping across waves and through clouds. The three panels below have openwork carvings of floral and flourishing leafage motifs. These motifs have a distinctive provincial flavor reflecting the culture of the northern nomadic minorities which populated China during the Yuan dynasty and influence artwork during the early Ming period. These nomads were used to things in nature such as flowers and grass, birds and small animals and often used them as motifs. They also have a special relationship with their horses as they roam the land for grass and water to nourish their herds, or at war. Heavenly Stallions, however, are rarely seen as a decorative motif on furniture, though it is said to have appeared as early as Song dynasty on architectural techniques. 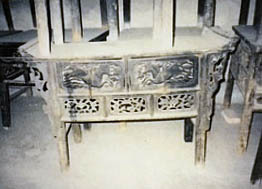 Thus, this Ming altar table, with this rare design, is a rare find. The drawer fronts retain original hasp plates that can secure the drawers by attaching the hasps to rings on the frame member below the drawers. The locks are missing. The front legs of this table are molded and are tenoned through to the table top. The front spandrels have carvings of flourishing leafage motif and are original. The back legs and small spandrels are plain. The lower part of the back legs have been replaced due to severe rotting from sitting on mud floors in central government warehouses during the Cultural Revolution. The wood was dried out and grayish-looking when the piece was found. After cleaning, a light coat of natural lacquer from the Lacquer Tree growing in China was applied to restore the color and to preserve the wood.